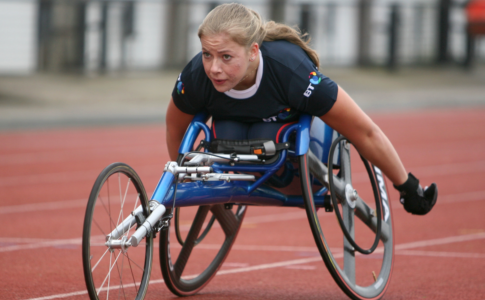 Hannah Cockroft is a 24-year-old British Wheelchair racer who has a habit of defying the odds and exceeding expectations. Not just because she is a double Paralympic gold medalist, or that she is seven-time World Champion; but because on top of all that, she is also a shining ambassador for sport and for those with seemingly impossible aspirations. Perhaps it was being told that she would never be able to walk, talk or do anything for herself that made Hannah determined to show the world through her sport that no matter what the dream, as long as the will is there, it’s achievable. Hannah was diagnosed with cerebral palsy at birth. She then suffered two cardiac arrests which damaged her balance and mobility, as well as her fine motor skills. Her determination and endurance on the track has earned her the nickname ‘Hurricane Hannah’ – a term of endearment from fans awed by her ferocity and sheer force. 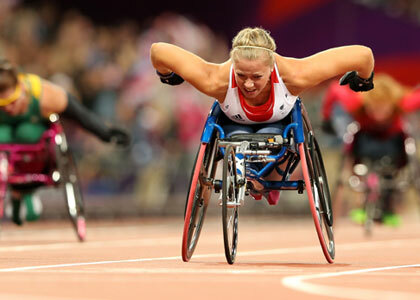 So it comes as no surprise that her main events are the 100 and 200m sprint events in the T34 classification. 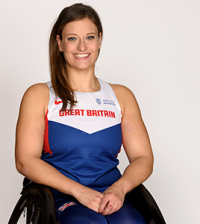 Sacha Shipway interviewed Hannah at the launch of the 2016 Paralympic Games on Channel 4, one month prior to the start of the Games, where the new Paralympic advert was launched. You said before that ‘people started looking at Paralympians as athletes’ after 2012. How do you think the London Games and the Superhumans programme and campaign have changed things? The whole campaign had a massive effect on how people saw us. Disability was hardly in people’s minds and it really made them see us as these icons: superheroes. It was just amazing how much it changed people’s perceptions and they see now that we can do whatever we want to, we just have to do it a different way sometimes. Watching the 2012 Paralympic Games advert gave me tingles. What do you feel when you look back and you watch it? It’s strange, that’s actually the first time I’ve seen that footage since maybe 2013, and you’re right, it does make me think that so much has happened in four years for me. You forget how amazing London was and then you watch something like that and it just transports you back. It makes you remember ‘in 50 days time I’m doing that again’ and it potentially could be bigger and better and it makes it all exciting again. I’ve heard you say that ‘everyone should go to Rio’. What is it you love about Brazil? I went out to Brazil in March with a sponsor – the people made it. I mean the scenery was incredible, but the people are so excited that the Paralympics are coming. I went training on Copa Cabana Beach and the amount of people who were running with me and taking pictures was incredible. They knew what the racing wheelchair was, they were shouting about the Paralympics coming! That’s what a Paralympics needs, it needs excitement, it needs people to come and fill the stadium and I think we are going to get that. So what does the lead up to Rio look like for you? I’ve got the Müller Anniversary Games next week, hopefully in front of a large crowd, which will be the last time to compete before Rio. The Anniversary Games will hopefully help us relive, and remind us of what it’s all about. It’ll be an amazing day. Then I’ve just got a couple of domestic meets, practising race tactics and skills going into Rio. Then on the 25 August we fly out! We have a 10-day holding camp in Bella Horizonte and then we fly into Rio and the Games start. I’m competing on 6 out of 10 days so it’s going to be a really full on Games. For London I competed 2 out of 10 days, so it’s a massive step up but, hopefully it will be incredible. You were 20 years old when you competed at the last Paralympic Games. How have things changed now that you’ve had four more years of experience, and what is it like going to this Games in comparison? Now, I’m going in as one of the well-known names, I’m reigning World and European Champion and I’m the World record holder. I couldn’t really put that much more pressure on myself – there is a lot of expectation and I do feel it. You kind of have to remind yourself ‘its me out on that track, no one else has done the hard work over these four years’, and its been a tough four years, a lot of competition has come through, a lot of new girls, a lot of new challenges and I’ve taken up two new disciplines – it’s been an incredible four years. The opportunities and chances I’ve had off the back of London have been amazing and the fact that the Paralympics has become this event that everyone knows about has been incredible to be involved in. You raced the 100m and 200m in the London Games and this year you’re also competing in the 400m and 800m races. What has it been like training for two new events? The 800m is completely out of my comfort zone. 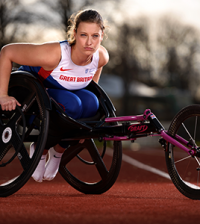 I had to get a new coach, a new training programme, I had to completely change myself as an athlete, change my mindset, change everything I know about wheelchair racing and it’s been a big learning curve. What you think of the new channel 4 Paralympic Games advert? It’s great, so different to the original Superhumans campaign. So it’s great that this advert has pushed forward the idea that, whatever you choose, you’ve got to believe you can do it, it doesn’t have to be sport, it can be music, it could be race car driving, it could be anything you want, as long as you believe you can do it, then you’ll find your own way and you will do it. As long as people have a passion then that is all that matters and you can do anything you want with that. 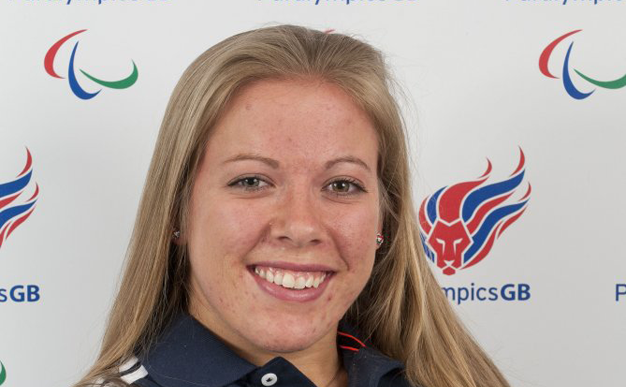 We wish Hannah and the rest of Team GB the best of luck at the Rio Games next month. She will be defending her title as Paralympic champion in the 100m and 200m in the T34 category, and going for gold in the 400m and 800m. 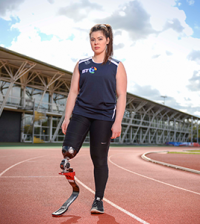 Channel 4 will broadcast over 600 hours of the 2016 Paralympics across all platforms, building on the multi award-winning coverage of 2012 and continuing to transform perceptions of disability.